Garlic Prawns or Gambas al Ajillo are another one of the most popular tapas dishes in Spain served in a hot, sizzling sauce of garlic, chilli & olive oil.. This quick and easy dish is so simple to prepare and is bursting with some wonderful flavors and aromas! They are usually served sizzling hot in individual terracotta dishes. The sweet and crunchy texture of prawns and the garlicky aroma go perfectly with a splash of white wine or sherry. Prepare lots of good crusty bread to mop up the liquid laced with olive oil at the bottom of the earthenware dish. This is definitely not a dish for those that don’t like garlic! 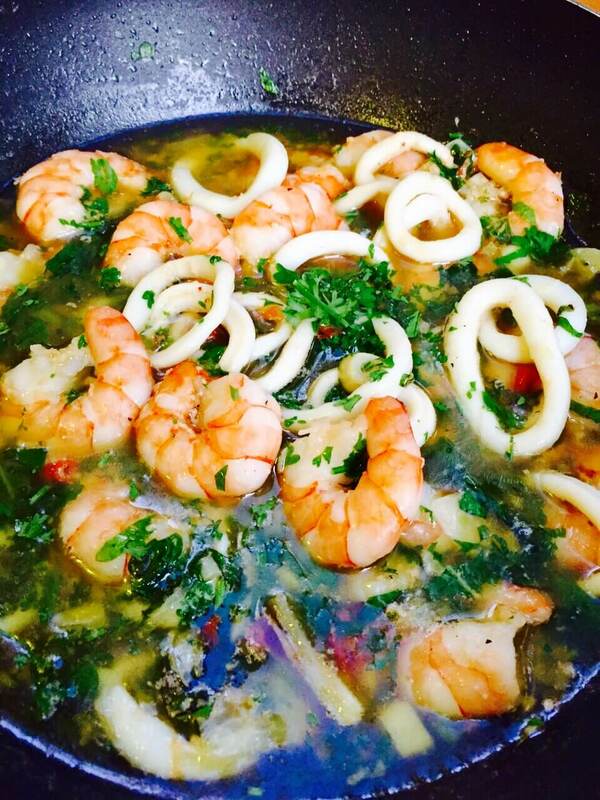 It is hard to go wrong with prawns, extra virgin olive oil, lots of garlic, freshly chopped parsley and fresh chillies! Marinade the prawns with 1 tsp of salt and 1/2 tsp baking soda and 15ml of olive oil. (Salt acts like a brine, helping the shrimp retain their juiciness, while baking soda causes the flesh to turn a little crunchy.) Leave to marinade for 30 minutes. Heat the remainder oil in a non stick pan or an earthenware dish over a medium heat. Once oil is hot, add the chillies and garlic. Stir and cook the garlic and chilli until golden brown taking care not to burn. Add the white cooking wine. Remove from heat and garnish with freshly chopped parsley and the dried chilli flakes. Finish it off with juice from 1/2 lemon and serve immediately. Adding squid rings work perfectly too.